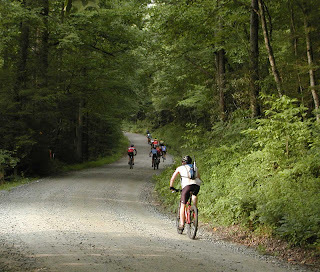 The Off Road Assault on Mount Mitchell is a 63-mile, mostly off road bicycle route which has 11,000 feet of accumulated climbing. 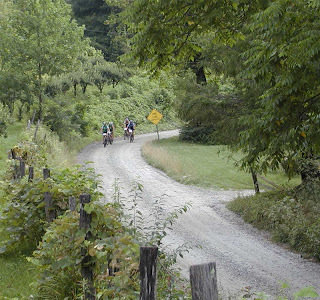 From Old Fort, cyclists climb over the Blue Ridge Parkway two times and just below Mount Mitchell on Forest Service roads and singletrack (a trail just wide enought for one person or bike). Mt. Mitchell peaks at 6,684 feet and is the highest peak east of the Mississippi River. 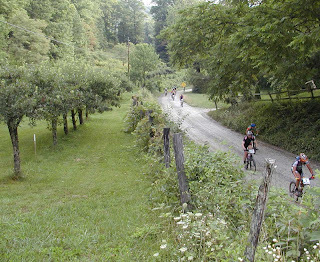 Our road (which we like to call our 2-mile tree-lined driveway, but, okay, it’s really a Forest Service road) was part of the route for the 8th Annual Off Road Assault on Mt. Mitchell on July 22. The old portion of highway 70 that’s barricaded near us is private property and the owner decided to revoke privileges for mountain bikers and hikers to use the road so that part of the route was switched over to our road. 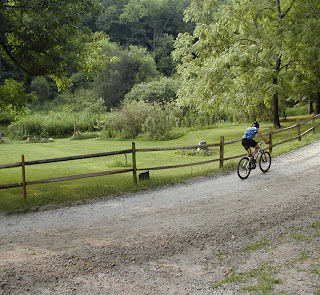 We hear that not being able to use Old 70 is a bummer for lovers of the original Kitsuma Loop trail, but, selfishly, it’s nicer for us since we enjoy seeing cyclists heading past the Inn from Mill Creek Road on the alternate route. When the NCDOT paves our road (crossing our fingers for next Spring), this should be a great route for riding. We had front row seats for the first part of the race since they started in Old Fort seven miles away. 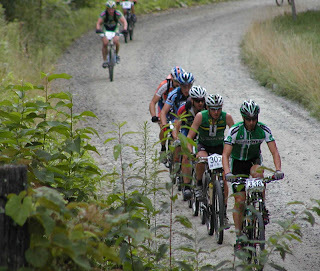 It was pretty exciting to see hundreds of die-hard mountain bikers heading up our road all day.